How does LoanStacker help your business? How much will you save with LoanStacker? Use our Return on Investment Estimates to find out! Read the LoanStacker / ViewWise Case Study to see how Mortgage Solutions of Colorado benefits from their new paperless workflow enabled by LoanStacker. LoanStacker can quickly scale your company be reducing costs and overhead, increasing efficiency during peak months, and minimizing seasonal labor costs! Contact us today to learn how we can save your firm time and money! Full support and maintenance included! LoanStacker’s document recognition, naming and seamless integration with the Encompass eFolder has made our company more efficient and profitable. Organized paperless files easily accessible by all departments from multiple locations has revolutionized HomeStar’s business. Prevents users from shipping loans unless all required documents are present and sorted in the correct stack order. Respond to customer inquiries instantly instead of taking a message and calling them back after you finally find the file you need. Without OCR, labeling each document is too labor intensive to be cost effective. Without labeling each document, a scanned mortgage file cannot be used to underwrite or ship to investors. Scanning solutions that require manual naming of documents can take more than 5 times longer to scan a mortgage loan file. Time savings are even greater when you consider the fact that OCR is automatic and can run in the background. A typical mortage broker will save $10-$25 per loan on paper, toner, equipment leasing and other office supplies associated with paper-based loan processing. Save trees and impress your environmentally conscious customers. Instantly deliver any document electronically, saving you thousands on FedEx/UPS charges, fax tolls and time spent stuffing envelopes, writing shipping labels, etc. Free up office space taken up by filing cabinets and file storage rooms. Eliminate off-site storage. 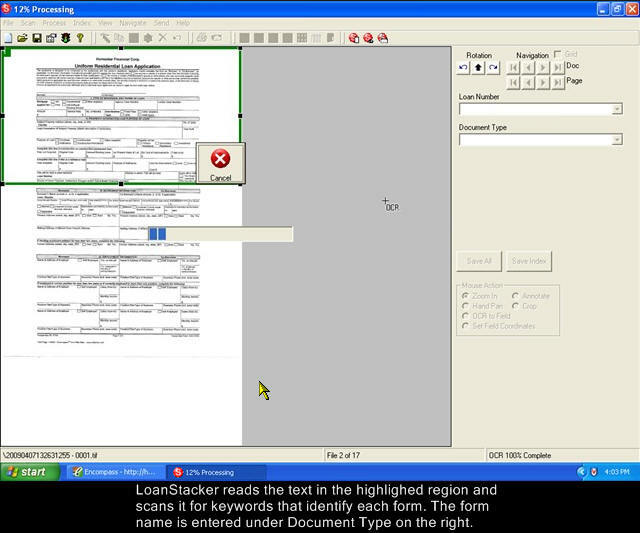 Any document can be viewed from any computer connected to your network. Files can be shared with multiple users without copying. Since each document in the loan is individually labeled, there is no need to flip through hundreds of pages to find the one you need. Many LOS packages have document tracking, checklists and business rules that only work if each document is scanned and identified in the loan’s e-folder. LoanStacker is the only way to unlock these features without adding hours of extra work to each loan. Apply investor stack orders automatically to create ordered PDF files that are ready for electronic submission. Recognition of documents does not depend on any specific barcodes or formatting. DocuTech, DocMagic, Calyx Point, VMP, etc. are all compatible. LoanStacker can be customized to recognize your company’s custom formats and internal documents, as well as non-standard documents like credit reports, bank statements, pay stubs, VOE, etc. Full list of recognized documents. Looking for a Custom Quote for your Mortgage Project?